The latest transmission from Francis Harris’ exquisite Scissor And Thread imprint showcases the many talents of Tokyo’s Tomi Chair aka Tominori Hosoya. The DJ and producer goes by both names, and here presents five tracks of lush, emotional music veering between ambient excursions and dance floor heaters. The original version of title track ‘Tropical Imagination’ opens the EP, and is a deep and thoughtful dance floor number. Elegant chords set the tone while the percussion adds a silky funkiness that’s impossible to ignore. The ‘Dream Version’ strips the track down to its pads and atmospheres. Next up is Tomi Chair’s ‘Heat Exhaustion’ – an exceptionally beautiful beatless piece that drifts through droney pads and occasional fragments of minor key melody. Using the Tominori Hosoya moniker, side B begins with ‘We Are Here’ – another powerfully restrained piece that merges woody percussion with low key pads and field recordings to create a magical whole. 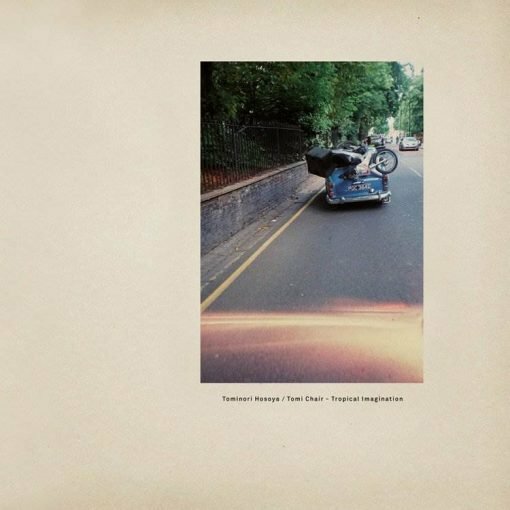 Francis Harris adds his touch to ‘Heat Exhaustion’ with his respectful Reform version, adding skittering percussion and underpinning the piece with a leftfield ambient house edge that builds and builds. Another essential addition to the Scissor And Thread catalog. More items from " Scissor and Thread "
More items from " Tomi Chair | Tominori Hosoya "